The first resource to provide students with guided science instruction using a daily practice format. 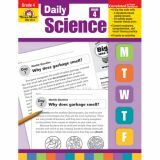 Thirty weeks of 10 -to 15-minute lessons introduce students to standards-based scientific concepts while they seek answers to real-life questions about the world they live in. Covers Life, Earth, and Physical Sciences. 192 pages. Explore beautiful 3-D patterns created by a magnetic field—mess free! Sealed plastic display tube enables 360-degree viewing. Keeps iron filings clean and safe. Just insert the magnet into the center chamber. 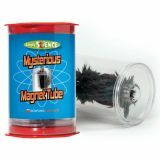 Includes display tube with encased iron filings, alnico cow magnet and multilingual activity booklet. Package measures 5.13”H x 3.5”D. Keep it simple with real STEM learning! Discover amazing engineering wonders through scientific exploration with colorful, engaging tools and hands-on activities and experiments. Introduce and explore all 6 simple machines as you make amazing discoveries, design solutions for real-world problems, and conduct your own investigations. lever board, wedge, pulley with rope and hook, cart with 4 removable wheels, Archimedes screw, 4 barrel weights, and 10 double-sided activity cards to build early engineering and problem solving skills. Comprehensive activity guide with reproducible materials is also included. Largest piece (cart) measures 5"L x 3½"W.
Light up the Sun with this version of the Orbiter. 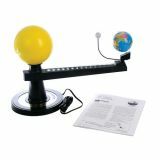 The model can be plugged into a standard wall outlet (UL approved - 8' power cord) to illuminate the Sun to effectively demonstrate daylight, night, seasons, and phases of the Moon. The Sun, Earth and Moon manually revolve around one another on this gear-driven model. The earth and moon are shown in true scale. The scale is 1 inch = 2000 miles. If the sun were to be shown at the same scale, it would be approximately 36 feet in diameter! Arm is 15", Sun is 6" and the Earth is 4" in diameter. 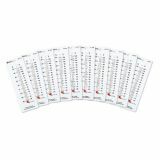 Includes an 8 page Lesson Plan which includes basic investigations and activities on Day and Night, The Seasons, The Moon, plus Observations and Activities. A great addition to your classroom when space is a problem. Use indoor or outdoor. Features a red drip pan with no drain. Rolls easily on four 2" locking casters. Comes with a white multi-use lid and two snap-on caddies. Simple assembly required. 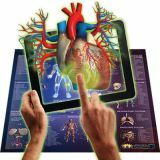 Measures 21" x 21" x 24" H.
Popar brings the human anatomy to life through an interactive Augmented and Virtual Reality infused laminated smart chart. Connect and play with the all the bodily systems through stunning animations, thought provoking game, educational read-alongs, and so much more! All Popar smart charts are designed with these key features to support and help your child enhance creative perception, learn about spatial and temporal concepts, and build listening comprehension. Measure liquids and solids in removable pans. 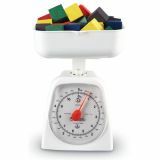 Easy-to-read, accurate English/metric scales have 5 kg/11 lb. and 2.2 kg/5 lb. capacities. Set of five sturdy plastic measures comes with detachable rings and nests for storage. 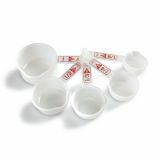 Includes 1/8 cup (29.5 ml), ¼ cup (59 ml), 1/3 cup (79 ml), ½ cup (118 ml), and 1 cup (236 ml) sizes. 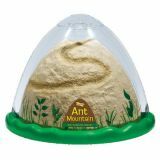 Take Ant Observation to new heights with Ant Mountain! Learn all about ants and how they live with our, escape-proof ant-tunneling kit. Our Ant Mountain has a fascinating inside/outside design which allows kids to watch their busy ants work cooperatively to tunnel, explore and forage throughout their rugged environment. Now anyone can become a myrmecologist (a person who studies ants) with Ant Mountain! Your ants will love tiny bites of celery, carrot or apple (about the size of a popcorn kernel) every three days. They also need a couple of drops of water every third or fourth day. Certificate to redeem your supply of 25 harvester ants by mail. An additional $4 fee ($5.00 Canadian) for shipping and handling your vial of ants is required when you redeem your certificate. Your ants are guaranteed to arrive alive. Or, you may choose to redeem your certificate for a Super Supply of 50 harvester ants. An additional $6 fee ($7.00 Canadian) for shipping and handling of your vial of ants is required when you redeem your certificate. If temperatures are extremely cold or hot (below 32 degress Fahrenheit or above 100 degrees Fahrenheit), please allow extra time for delivery. Harvester Ants will live 2 to 4 weeks in Ant Mountain. Did you know ants use their chemical scent trails to find their way back to their nests? Recommended for ages 6 and up with adult supervision. Please note: Due to shipping restrictions, live ants cannot be shipped to Oregon or Hawaii. 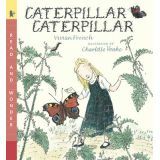 The best way to learn about a caterpillar is to watch one close up. With love and care, a grandfather shows his granddaughter the tiny dome-shaped eggs, explains how caterpillars shed their skins as they grow bigger and bigger, and watches with her as one special caterpillar emerges from its pupa transformed into a beautiful butterfly.